To introduce the newly created “economic owning, renting and temporary own-rent switching” concepts in either Western financial system or under the Islamic finance principles is a radically new endeavor. However, as mentioned above, the Muslim consumers will be much more receptive to these new innovations due to their religious belief that men shall not be excessively burdened by the interests from using other people’s money. These ideological differences have created two distinct preference approaches from the two opposite ends of the same spectrum of economic ownership of the Islamic financial system vs. the Western financial system. In the Western financial system, people have access to easy credit and therefore take it for granted that they should own instead of rent whenever possible. That is why it is quite unusual to see people renting single-family houses in the suburbs in America. With the easy credit system having been abused to the extreme in recent years, we are seeing the fallouts from the big implosion of this loose lending practice in the US today. So the way to introduce the new economic ownership concept as facilitated by SwapRentSM transactions under this situation is to let people who already own homes (i.e. they already own 100% legal title of the property) to start giving up some part of the future appreciation through the concept of economic renting. Therefore, a package of 100% legal owning plus economic renting through SwapRentSM contracts seems to be the right recipe for the homeowners in the Western world in order to de-leverage. This is due to the fact that the mistakes have already been made to allow those people who cannot afford to own in terms of monthly income to become owners of a property. The newly created mortgage product to rescue them would be the SwapRentSM embedded AITD (All Inclusive Trust Deed) structure called HELM (Home Equity Locking Mortgage). 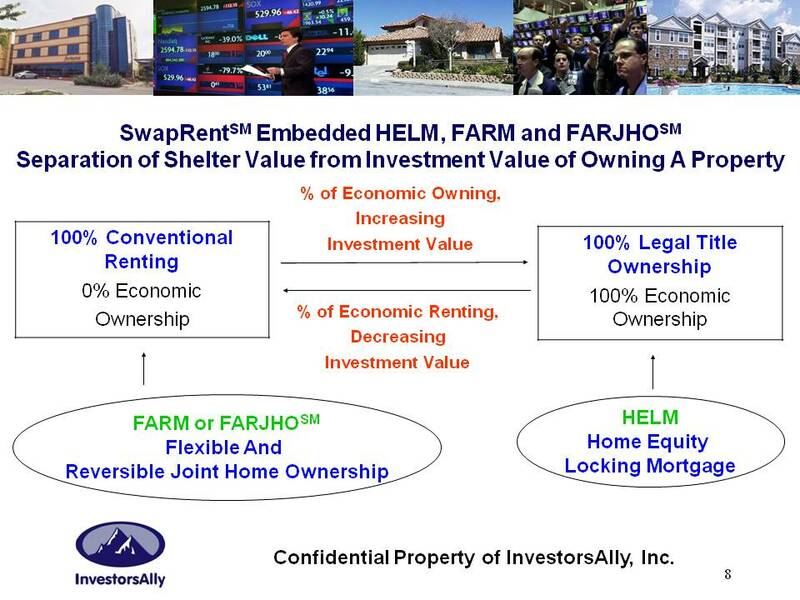 As explained above, the HELM product is a wrap-around new package of the homeowner’s existing under-water 1st mortgage and a contingent 2nd mortgage based on the outcome of the property value at the end of the embedding SwapRentSM contract. On the other hand, for consumers under the Islamic finance preference, in order for them to comply with the Sharia laws, we could introduce the economic ownership concept as facilitated by SwapRentSM transactions to a modified Diminishing Musharakah structure by letting people start from being a 100% legal renter and flexibly buy into more (or less later on) economic ownership during a certain period of time. Therefore the entry point for introducing the new economic ownership concept under this situation is a package of 100% legal renting plus flexible and reversible economic owning through SwapRentSM contracts during the course of the intended ownership period. For example, a would-be homeowner could start out using a lump-sum cash to purchase to own 10% of the house value in a co-ownership trust account with a bank or any other types of housing finance providers. The bank will own the remaining 90% of the property value in this co-owned trust account. If nothing else happens, the consumer pays $1,000 a month as a real monthly rent payment to the trust account for the duration of a contract say, 5, 10, 15, 20 or 30 years. He will be able to occupy and use the property irrespective what will happen to the financial value to the property during this period. The bank in this case could use SwapRentSM contracts itself to hedge its 90% exposure to real estate property market derived from this co-ownership structure. Quantitatively speaking, banks that offer FARM products to homeowners will end up being a middleman earning the same interest rate spreads, no more, no less, while exposing much less default risks incurred by the homeowners. Through the years, as the consumer may have a better job and a higher monthly income later, he could afford say another $500 monthly. He could decide to use this additional monthly income to buy in another 50% of the “economic ownership” of the property which will entitle him another half of the financial value of the future appreciation of this property for a certain period of time (say 5, 10 or 20 years). Together with the 10% legal title he already owns he would then have a total of 60% economic ownership now. This is assuming that the full economic ownership of the property may cost $2,000 a month for the same period of time in an equivalent interest-only Western mortgage. So with $1,500 monthly payment, this homeowner gets to occupy the property for as long as he likes (the first $1,000 in the monthly payment) and he will also have a total of the 50% of the future appreciation of the property within the specified time period (the next $500 in the monthly payment) plus the 10% legal title in the trust account. When he gets lucky with a bonus, a game show winning or the handsome proceeds from a sale of other financial assets that he may own, he could decide to use this lump sum money to buy into the remaining legal ownership shares in the co-ownership trust account from the bank at any time at the prevalent market price during the intended life of the contract to claim the full legal title to the property. This buy-in decision on the legal or economic ownership should be based solely on his investment views as he does not have to make this investment into the property that he occupies. To buy or not to buy the appreciation potential of his house will not in anyway change the status of his right to perpetual (or for a period, say 2, 3, 5, 8, 10, 15, 20 or 30 years) tenancy of this property. He could very well use this new additional monthly income to invest in other investment products such as annuities, shares in public companies in a dollar cost averaging program or many other investment choices. For low-income families, they may not even need to use this additional monthly income for investment in the property markets at all. The money could be better spent on their children’s education, a bigger TV, a faster computer or a bigger family car. When the head of households has climbed up the corporate ladder and they have become truly middle-income families they could use those additional income any time they want for investment purposes through the SwapRentSM contracts without having to move out of their existing home. Without the benefits of SwapRentSM, HELM or FARM the low-income families have no other choice but to put the bulk of their money income into maintaining the ownership of their homes and subject to the investment risks as we have already seen from the current subprime mortgage lending abuse fallouts. The homeowner could also unwind or sell these appreciation units represented by SwapRentSM contracts prematurely just like he could sell an annuity contract prematurely or the shares he may own in a public company. When he loses this additional monthly income ability (say, being laid off from his job or having incurred some other disability issues), he would simply have to sell these appreciation units represented by the SwapRentSM contracts like he would have to sell any other types of investment products to alleviate him from those monthly payment obligations. This again, should not have any impact on his right to the tenancy of the property as long as he continues to pay the monthly rent, the same basic $1,000 per month. As explained before, under adverse economic situations, his ability to pay the rent to continue to enjoy the home as a shelter might be covered under the social safety net such as unemployment insurance benefits that are usually available in most developed countries. As a result under this new housing finance system there will no longer be any social damages of foreclosures, evictions, forced relocations, etc. to the homeowners as these devils prevalently exist in both the Western mortgages and the Islamic mortgage products currently being practiced all over the world. So let’s say with the same example, this homeowner started out buying into 10% of the house value using a lump sum of cash (i.e. down payment in the current mortgage product lingo). Through the intended life of the ownership, he could use SwapRentSM contracts to flexibly and reversibly buy more, say another 20%, 30%, 50%, 90% or even 150% of potential appreciation of the house in the form of economic ownership for a certain period of time or he could use SwapRentSM contracts to reduce his economic ownership down to only 5%, 2% or 0% (depending on the bank’s credit policy and the consumer’s own credit records) of the house value at any time he chooses based on his then economic income capability or simply his investment views on the real estate market. Of course he could also buy the appreciation potential of a house price index that represents his neighborhood or city. As explained before in other section, if he plans to move to other cities in the near future, he could also buy the appreciation potential of the house price index of that other city instead. The creativeness in this new housing finance structure offers flexibility and reversibility for the homeowners. It is no longer a one-way diminishing ownership structure for the bank. Therefore, for the Muslim consumers, instead of the old name “Diminishing Musharakah”, this new innovative structure as facilitated by the SwapRentSM transactions could be called a FARM – “Flexible And Reversible Musharakah” for Muslim consumers or “Flexible And Reversible Mortgage” for Western consumers. In a sense, through SwapRentSM contracts, the economic interests or the financial consequences of changing between owning and renting “economically” through time have been successfully carved out of a conventional property ownership and segregated from either the owner’s legal title ownership or his legal right to occupy and use the property that he calls home. Although this latter new housing finance product which was created by a combination of legal renting and economic owning/renting using SwapRentSM transactions was initially put together with the desired requirement to be Riba-free for the Muslim consumers in mind, there really do not exist any valid practical reasons why the Western consumers can not use and enjoy these same benefits from the new innovations too under the existing Western legal financial system framework. As mentioned before, ideological mental block seems to be the only obstacle that is stopping the consumers, the bank providers and the governments from taking advantage of these new innovations to form a new alternative housing finance system in the Western world. It may appear complicated simply because these concepts and methodologies are new to most people upon first learning about it. Given some time as the knowledge spreads at lightening speed in this cyber age, in the foreseeable future people may feel how come we did not have something like this earlier in our banking practice. By the time the Muslim countries have embraced these new innovations, there could very well be a chance that the Islamic banking practices could become much more mainstream in the near future than the Western financial system practices are today. So in summary, after the burst of the Western mortgage lending bubble, the SwapRentSM embedded HELM would be the best new innovative solution for the existing mortgage lenders and banks to solve their current mortgage default and foreclosure problems. For newly set up mortgage lenders or banks thinking about getting into the housing finance business for the first time, the SwapRentSM embedded FARM may be the best new innovative structure for them and their governments to consider in order to set up a brand new housing finance system which is not solely based on lending, irrespective of whether they plan to target Western consumers or Muslim consumers in any parts of the world.